With a number of businesses in the light commercial sector relying on unvented water heaters to serve multiple outlets at the same time, Roy Marsden, Product Manager at Heatrae Sadia, provides a checklist of features contractors should be looking for in their bid to minimise both installation and running costs for their customers. Many commercial premises have a hot water requirement remote from the main heating plant, so utilise independent ‘point-of-use’ water heaters. These are small capacity units and are installed close to the outlets they are supplying. Historically, point-of-use heaters tended to be of the ‘open outlet’ type, meaning they could only supply one outlet point. However, pressurised point-of-use heaters are now more commonplace which don’t require a vent pipe, can serve multiple outlets and offer much higher delivery pressures allowing for a greater choice of tap fittings. For M&E contractors working on a range of commercial projects, from washrooms to commercial kitchens, they need a solution that is easy to install that also delivers unrivalled performance to the end-user. While unvented hot water heaters seem to be the solution of choice for a variety of commercial applications there are a considerable number of variations of these products on the market, making it confusing for contractors to find the right ones for their customers. While there are various considerations which need to be made in the specification of unvented hot water heaters, from sizing to taking into account water supply and quality, contractors must also differentiate between the vast number of these systems available on the market. To help with this process, contractors should consider the ErP rating, smart technology integration, and usability of the product. With so many systems on the market, the biggest differentiator is often assumed to be price, making it easy for contractors to simply go for the cheapest option. However, what can truly set these systems apart is efficiency, with unvented water heaters able to play a vital role in the overall efficiency of a light commercial heating system. What’s more, if contractors prioritise efficiency measures over price, it will only help to boost their reputation in the future, allowing them to potentially win more work. 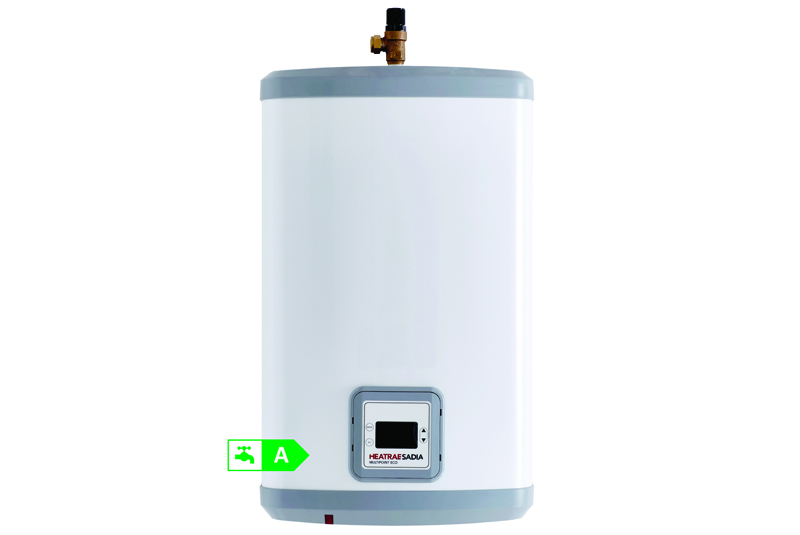 With premium performance combined with efficiency credentials resulting in lower installation and running costs for customers, opting for an A-rated water heater, where possible, will ensure that contractors are remembered by their customers for offering long-term savings. Unvented point-of-use water heaters have become smarter, and it is important for contractors to look out for these features so they can offer a real benefit for the end-user. For example, unvented point-of-use water heaters with smart thermostatic controls provide the ability to continuously monitor and learn typical usage patterns optimising the water heater operation, reducing energy consumption and improving efficiency. Some systems will also offer vacation modes so water isn’t heated unnecessarily when a building’s occupants are away. Utilising the latest technology, Multipoint Eco incorporates the above features as well as smart function controllability which recognises and self manages high and low demand periods to maximise energy savings – even when installed in applications utilising off peak tariffs. Usability should be a key factor as it is important for any display to be easy for the contractor, end-user and facilities manager to navigate. Point-of-use water heaters now come with a variety of stylish and intuitive digital controls and displays which allow for easy control and temperature reading at point of use, further encouraging Facilities Managers and end-users to get more familiar with their water heater. With simple controls, contractors can confidently handover the product to the end-user without the fear of being called back at a later date to clarify more technical details. Ultimately, the specification process doesn’t stop at ensuring a point-of-use water heater is fit for a building’s purpose in terms of meeting demand. It’s equally important for contractors to look beyond this and consider how these products will be used by the building’s occupants and how they will benefit from them in terms of long-term efficiency gains.